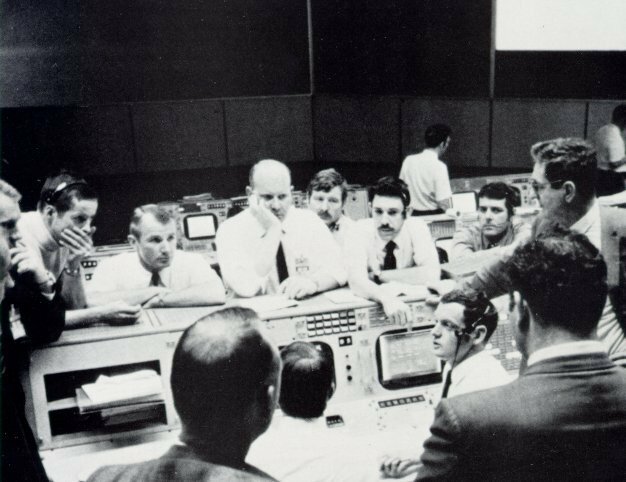 In Mission Control the Gold Team, directed by Gerald Griffin (seated, back of head to camera), prepares to take over from Black Team (Glynn Lunney, seated, in profile) during a critical period. Seven men with elbows on console are Deke Slayton, Joe Kerwin (Black CapCom), Vance Brand (Gold CapCom), Phil Shaffer (Gold FIDO), John Llewellyn (Black RETRO), Charles Deiterich (Gold RETRO), and Lawrence Canin (Black GNC). Standing at right is Chester Lee, Mission Director from NASA's Washington headquarters, and broud back at right belogs to Rocco Petrone, Apollo Program Director. Apollo 13 had two other "ground" teams, the White and the Maroon. All devised heroic measures to save the mission from disaster. Since Apollo 13 many people have asked me, "Did you have suicide pills on board?" We didn't, and I never heard of such a thing in the eleven years I spent as an astronaut and NASA executive. I did, of course, occasionally think of the possibility that the spacecraft explosion might maroon us in an enormous orbit about the Earth - a sort of perpetual monument to the space program. But Jack Swigert, Fred Haise, and I never talked about that fate during our perilous flight. I guess we were too busy struggling for survival. Survive we did, but it was close. Our mission was a failure but I like to think it was a successful failure. Apollo 13, scheduled to be the third lunar landing, was launched at 1313 Houston time on Saturday, April 11, 1970; I had never felt more confident. On my three previous missions, I had already logged 572 hours in space, beginning with Gemini 7, when Frank Borman and I stayed up 14 days- a record not equaled until Skylab. Dr. Paine said no, the risk was too great. So I said in that case we'll be happy to accept Jack Swigert, the backup CMP, a good man (as indeed he proved to be, though he had only two days of prime-crew training). The second omen came in ground tests before launch, which indicated the possibility of a poorly insulated supercritical helium tank in the LM's descent stage. So we modified the flight plan to enter the LM three hours early, in order to obtain an onboard readout of helium tank pressure. This proved to be lucky for us because it gave us a chance to shake down this odd-shaped spacecraft that was to hold our destiny in its spidery hands. It also meant the LM controllers were in Mission Control when they would be needed most. Then there was the No. 2 oxygen tank, serial number 10024X-TA0009. This tank had been installed in the service module of Apollo 10, but was removed for modification (and was damaged in the process of removal). I have to congratulate Tom Stafford, John Young, and Gene Cernan, the lucky dogs, for getting rid of it. This tank was fixed, tested at the factory, installed in our service module. and tested again during the Countdown Demonstration Test at the Kennedy Space Center beginning March 16, 1970. The tanks normally are emptied to about half full, and No. 1 behaved all right. But No. 2 dropped to only 92 percent of capacity. Gaseous oxygen at 80 psi was applied through the vent line to expel the liquid oxygen, but to no avail. An interim discrepancy report was written, and on March 27, two weeks before launch, detanking operations were resumed. No. 1 again emptied normally, but its idiot twin did not. After a conference with contractor and NASA personnel, the test director decided to "boil off" the remaining oxygen in No. 2 by using the electrical heater within the tank. The technique worked, but it took eight hours of 65-volt DC power from the ground-support equipment to dissipate the oxygen. With the wisdom of hindsight, I should have said, "Hold it. Wait a second. I'm riding on this spacecraft. Just go out and replace that tank." But the truth is, I went along, and I must share the responsibility with many, many others for the $375 million failure of Apollo 13. On just about every spaceflight we have had some sort of failure, but in this case, it was an accumulation of human errors and technical anomalies that doomed Apollo 13. At five and a half minutes after liftoff, Swigert, Haise, and I felt a little vibration. Then the center engine of the S-II stage shut down two minutes early. This caused the remaining four engines to burn 34 seconds longer than planned, and the S-IVB third stage had to burn nine seconds longer to put us in orbit. No problem: the S-IVB had plenty of fuel. The first two days we ran into a couple of minor surprises, but generally Apollo 13 was looking like the smoothest flight of the program. At 46 hours 43 minutes Joe Kerwin, the CapCom on duty, said, "The spacecraft is in real good shape as far as we are concerned. We're bored to tears down here." It was the last time anyone would mention boredom for a long time. At 55 hours 46 minutes, as we finished a 49-minute TV broadcast showing how comfortably we lived and worked in weightlessness, I pronounced the benediction: "This is the crew of Apollo 13 wishing everybody there a nice evening, and we're just about ready to close out our inspection of Aquarius (the LM) and get back for a pleasant evening in Odyssey (the CM). Good night." On the tapes I sound mellow and benign, or some might say fat, dumb, and happy. A pleasant evening, indeed! Nine minutes later the roof fell in; rather, oxygen tank No. 2 blew up, causing No. 1 tank also to fail. We came to the slow conclusion that our normal supply of electricity, light, and water was lost, and we were about 200,000 miles from Earth. We did not even have power to gimbal the engine so we could begin an immediate return to Earth. The message came in the form of a sharp bang and vibration. Jack Swigert saw a warning light that accompanied the bang, and said, "Houston, we've had a problem here." I came on and told the ground that it was a main B bus undervolt. The time was 2108 hours on April 13. Next, the warning lights told us we had lost two of our three fuel cells, which were our prime source of electricity. Our first thoughts were ones of disappointment, since mission rules forbade a lunar landing with only one fuel cell. With warning lights blinking on, I checked our situation; the quantity and pressure gages for the two oxygen tanks gave me cause for concern. One tank appeared to be completely empty, and there were indications that the oxygen in the second tank was rapidly being depleted. Were these just instrument malfunctions? I was soon to find out. Thirteen minutes after the explosion, I happened to look out of the left-hand window, and saw the final evidence pointing toward potential catastrophe. "We are venting something out into the- into space," I reported to Houston. Jack Lousma, the CapCom replied, "Roger, we copy you venting." I said, "It's a gas of some sort." It was a gas-oxygen-escaping at a high rate from our second, and last, oxygen tank. I am told that some amateur astronomers on top of a building in Houston could actually see the expanding sphere of gas around the spacecraft.